Discover with conservation guides the realm of the elusive Snow Leopard, one the world’s most mysterious and rare species, in the Kyrgyzstan’s largest protected area, the Sarychat-Ertash Reserve. The mountain valleys bordering China, where the Snow Leopard roams, are abundant with wild species including Marco Polo sheep, Ibex, Yak, Marmot, Fox, Wolf, Golden Eagle, and Griffon Vulture. Enjoy the glacial summit peaks on foot or horseback, as preferred. Additionally, you shall have the opportunity to experience nomadic traditions in a yurt camp, explore the historical sights of the Silk Road, and enjoy the serenity of Kyrgzstan’s most spectacular alpine lake. Transfer from airport to Bishkek city. Late morning leave to Ala Archa National Park for acclimatisation trekking (3.4km / +800 m). Visit a waterfall and enjoy lunch in wilderness. Return to Bishkek in the afternoon. Dinner at local restaurant and overnight in a hotel. After breakfast, check out from hotel in Bishkek. Drive to Bokonbaev village, stopping at the Burana complex where we will visit Burana Tower, a historical museum and Balbal gravestones, sights of the Silk Road. Enjoy lunch at a local family house. 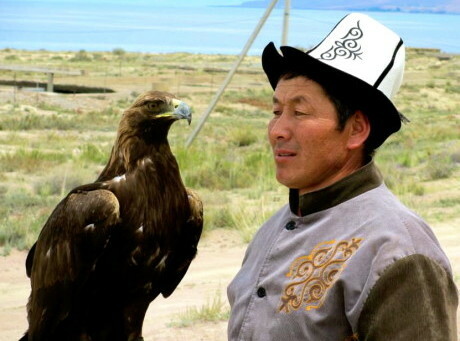 Whilst driving by the southern shore of Issyk Kul Lake, the world’s second largest alpine lake after Lake Titikaka, we will see an eagle hunting demonstration at Jaichy gorge. In Bokonbaev village we will have dinner and stay at guest house. After breakfast we will drive to Uch Kochkon village which is located at area of unique high mountain steppes with year-round permafrost. We will see Barskoon Gorge, Sary Moinok Pass, Barskoon Pass, and Arabel Valley, where one of Central Asia’s biggest rivers, Syrdarya, begins. Picnic lunch will be on the Taragai River bank. After a stop in Kara Say village for border zone registration we will drive to Uch Kochkon village (3150m). We will have dinner and overnight at a guest house. Before dinner from village we will take a short drive to Ak Sjirak river canyon, which is more than 60 meters deep. After breakfast, we drive 18km to Koyondu Ranger Station where we will have riding and safety instruction. We enter one of the biggest nature reserves in Kyrgyzstan, Sarychat-Ertash Reserve, with area of 150 thousand hectares. We will ride over Eshek Art pass (4200m) through a landscape of high meadows and beautiful panoramas of 5000 metre high glacial summits. On the way we will visit one mountain glacier and enjoy a picnic lunch. On the slopes near the pass we might see Marco Polo sheep, Vulture, and Golden Eagle. Upon arrival at Ranger station we will have some tea before our hike to the bank of Sarychat River, which flows towards the Tarym basin in China. With this hike we will acclimatise and see Marmots, Rabbits, Eagles, Vultures, plus, depending on season also Ibisbill. In this area, Eagles have their nests. Dinner and overnight tent at Eshek Art Ranger station. Today we shall see glaciers and wild animals. It is the key area for observing Marco Polo sheep. Last December rangers count 1500 Marco Polo sheep and 6 Wolves near the glacier. Animals to see include Marco Polo Sheep, Vulture, Golden Eagle, Marmots, Hare, and Eagles. After breakfast we will walk to Solomo Gorge. On the way to camera trap and from that spot we will see Marco Polo sheep, Ibex and another animals, perhaps lucky enough at a 50 metre distance. From the trap point we will observe the surrounding rocky summit slopes around using binoculars. In this area we will research Snow Leopard footprints and possibly see the Leopard itself. Rangers will indicate footprints, markers, and explain snow leopard behaviour. Picnic at the camera trap before returning back to camp. Dinner and overnight at tents. Today, we will see Marco Polo sheep, Ibex, Vulture, Golden Eagle, plus, probably Fox, Wolf, and Snow Leopard. Today we will first walk 9km up to the Kara Kiya Pass (4074m) and enjoy the great panorama of Central Tyan Shan peaks. We rest with tea or coffee before walking another 3km to the main road where we will meet our vehicles and drive to the yurt camp on the shore of Issyk Kul Lake. Lunch in the wild, prepared by our cook. Dine and sleep in yurt. Transfer to Bishkek. Lunch in local cafe restaurant before transfer to your hotel. Farewell dinner at a local restaurant. City tour in Bishkek visiting the historical museum, museum of fine arts, and central square Ala-Too. Overnight in Hotel. Lunch and dinner at a cafe restaurant. Transfer from Bishkek to Manas Airport.